Packing is one of the most stressful parts of getting ready to go on vacation. If you start placing items in your suitcase without thinking about what you really need, you're likely to end up taking too much stuff or leaving out a few items that are really important. That's why LoveToKnow has created this printable vacation checklist that you can download and customize to make packing easier and much less stressful. 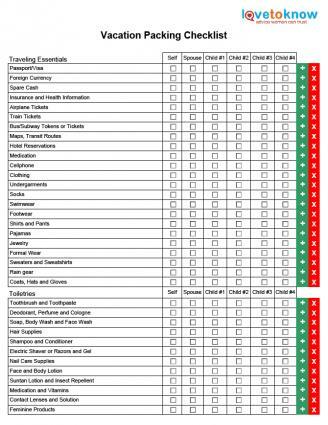 If you want to reduce the amount of stress associated with getting packed and ready to leave for your next vacation, be sure to use the checklist provided here. To access the document, simply click on the image on the top left of this article. Once you do, a PDF document will open that you can save and edit. Simply click on the disk icon in the menu bar to save the document and begin making adjustments so that it meets your specific needs. The checklist includes columns for you, your spouse, and up to four children. A number of commonly needed vacation items are included on the list, but it's likely that what has been provided doesn't exactly match your needs. Use the red "X" buttons to remove items that you don't plan to take and use the green "+" sign to add blank rows that you can label with any item(s) of your choice. Once you are finished customizing the form, you can print a copy and check off each item with a pen or pencil as you pack it. If you prefer, you can mark items complete directly in the form by clicking on the box in the appropriate column. Using this checklist can help reduce the stress you experience when preparing to go out of town on vacation. Instead of getting flustered and stressed out wondering if you've remembered to include everything in your luggage, putting this document to work for you can help you get in the right frame of mind to relax and enjoy your vacation getaway.